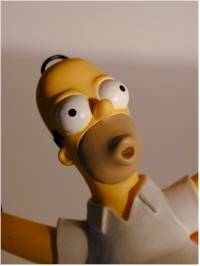 Last spring, Hamilton Collection solicited for a Homer Simpson sculpture (and a Bart, which has since been cancelled). Titled "Woo-Hoo", it is a numbered, limited edition. This ad went out in the supplement for various Sunday papers across the country. They didn't get a whole lot of response, probably because most Simpsons fans don't read a lot of Sunday supplements. Unfortunately, this lack of advertising meant that when they did ship, people thought they had completely missed out. They have been going for 3 times retail already on Ebay, but hope is not lost! Hamilton is fairly well known for doing decent work, and this statue is no different. The sculpt is clean, with great details. 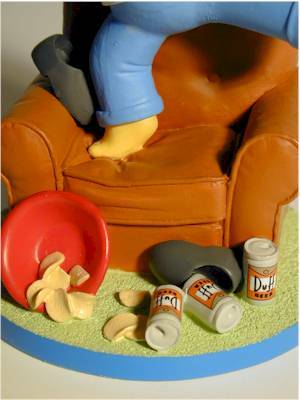 The chips almost look real, and even the indent on the chair looks just right. The status is about 4 1/2" tall. 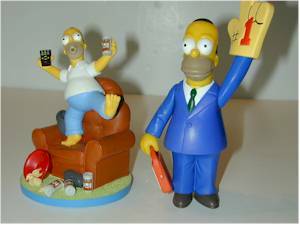 The bottom picture on the left shows it next to a Playmates Homer for size comparison. Considering the cost of many sculptures these days, the $20 price tag on this one is pretty damn good. These are running as much as $60 or $70 already on ebay, but are still available directly from Hamilton. Don't get taken! Unfortunately, the paint work isn't quite as good as the sculpt. There is some slop around the areas where the yellow meets other colors, such as the couch or the remote. The white shirt also isn't completely white - the color below is showing through a bit. This sloppiness in the paint hurts the overall excellent sculpt. At twenty bucks, this is a great deal. 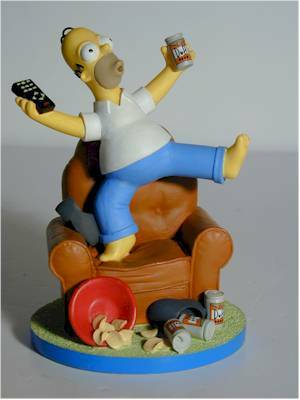 It's a nice sculpture, well done and executed, with Homer in a terrific pose and style. It fits the character's personality, particularly in the early days of the show. Here's really the whole point for this review - these can be purchased from Hamilton directly, and you do not have to resort to ebay prices yet. The run on these was for 95 days, so that's an awful lot of statues. Call 1-800-228-2945, and tell them you'd like to order item number 32310. They'll hook you up, and you should have it within two to three weeks.